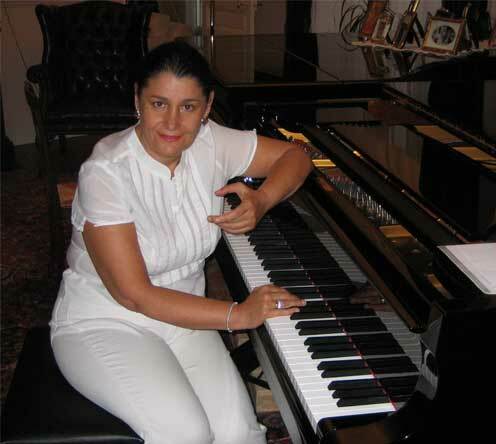 Concert pianist Mira Yevtich was born in Belgrade and started playing the piano at a very young age. From 1971 to 1976 Ms. Yevtich studied and graduated her Bachelor of Music degree as Concert Pianist and Chamber Musician at the Tchaikovsky Moscow State Conservatory. In 1978 to 1980 she was awarded the Doctorate as a Concert Pianist at the Moscow State Conservatory and in 1987-1990 she was appointed for the Doctorate as a Concert Pianist and in piano teaching at the Gnessin State Institute. At the International Festival of Modern Music, St. Petersburg in 1988, Ms. Yevtich was chosen among over 300 performers by the German record company Col Legno to make a live recording of Piano Concerto no. 2 written by Ivan Jevtic. She is also a winner of an International Piano Competition in former Yugoslavia. International concert engagement Worldwide followed and during the period 1995 to 1997 Ms. Yevtich held the appointment as professor for piano at the Australian Institute of Music, Sydney; in between having held the position of visiting professor for piano at the St. Petersburg Conservatory. Holding Australian nationality, Mira Yevtich is often invited as guest performer at the Sydney Opera House, Liszt Society, and Sydney Radio and at the Sydney University AIM, AICM New South Wales, Adelaide and Canberra. Ms. Yevtich continue to perform internationally as soloist and recitals in the Great Philharmonic Hall, St. Petersburg at the ‘White Nights Festival’, in Finland, Croatia, France, Germany, Italy, Austria, Turkey, Russia and America. Ms. Yevtich has regularly performed as soloist with internationally renowned conductors such as Gergiev, Svetlanov, Katz, Gerg, Rat, Yuri Bashmet, Dmitry Yablonsky, Akiro Naito, Andre Pereigne. Ms. Yevtich has recorded several CD’s for various labels including four CD’s for Bel Air Music and is joint organizer, with the Australian composer Grant Foster, of The Southern Highland International Piano Competition in Bowral, Australia. After the St. Petersburg World Festival for Contemporary Music, Mikhail Bialik wrote: “The renowned Mira Yevtich gave a brilliant performance and made us listen to the 2nd concerto for piano and orchestra by the composer Ivan Yevtic and the 1st concerto for piano and orchestra by Brahms. Mira Yevtich did not only demonstrate a technical brilliance but also a moving interpretation, without reserve, that one finds only in the rarest of talents. An exceptional interpretation of composers including Beethoven, Brahms, Tchaikovsky and Scriabin by a musician that evidently knows the soul of the music”. The Sydney Morning Herald, Australia wrote: “With the passing of years it is not often that one has the opportunity to listen to the sublime performances of Mira Yevtich. Her virtuosity and education reveal a rare talent, energy and love for music. Her repertoire includes a vast program of classic and modern composers such as Haydn, Beethoven, Mussorgsky, Prokofiev and Rachmaninov to mention a few. We are proud and delighted with the opportunity to ‘steal’ this exceptional artist from the European concert halls and wish it will be possible to listen to her again in the years to come”. Ksenia Bashmet was born in Moscow in 1980. Ksenia graduated from the Gnessins` Special Music School under Professor Elena Efrussi and Tatiana Zelikman, and later from the Moscow State Conservatory where she studied under professor Lev Naumov. Ksenia is now a postgraduate at the Moscow Conservatory studying chamber music with Tigran Alikhanov, and accompaniment with Irina Kirillova. She was awarded a diploma at the International Festival “Virtuosi 2000”, the 3rd prize on the First Taneyev International Chamber Music Competition, Kaluga, 2002 and 2nd prize in the 18th International Chamber Music Competition, Caltanissetta 2003.